Ninurta's wisdom and his passion for the scribal arts are attested in his epithets. In Lugale he is called "the very wise" (gal-zu, ln. 152) and "gifted with broad wisdom" (gítu-dagal, ln. 153). When Ninurta blocked the powerful waters threatening the land by means of stones in the epic, he is described to have applied his great wisdom and cleverness on the situation (347ff.). The Standard Babylonian epic of Anzu describes how Ninurta took hold of the Tablet of Destinies in the battle against Anzu who had stolen it. The possession of the Tablet of Destinies was also an important characteristic of Babylonian Nabu in his capacity as the god of scribal arts. We know that the Anzu epic existed already in an Old Babylonian version which told the same story. So I feel confident to claim that as the holder of the Tablet of Destinies, Ninurta precedes Nabu. 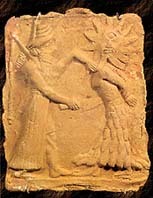 In the Standard Babylonian version, after Ninurta's triumph over Anzu the great gods entrust to Ninurta a divine secret. By seeing the sign of Ninurta's victory, Dagan rejoices, summons all the gods and says to them: "The mighty one has outroared Anzu in his mountain ... Let him stand with the gods his brethren, that he may hear the secret lore, [let him hear] the secret lore of the gods" (III 26.30-31). The knowledge of the secret lore (piritu) is an award which was not promised to Ninurta by the mother goddess before he went to the battle, but attested in the other sources. Ninurta was called ēmi piriti "who has heard the secret" (Lugale 153, e-ura), or bēl piriti "the master of the secret lore" (see van Dijk 1983: 6). Among the mystical names which are given to Ninurta in the epilogue of the Anzu epic is E-Ibbi-Anu (III, 133) which is explained as 'Master of the Secret Lore' (bēl piriti - en ad.hal). During the second millennium the role of scribe was taken over by Nabu from Ninurta in Babylonia. Ninurta's importance was revived in Assyria by the kings Tukulti-Ninurta the first and Assurnasirpal the second, but from the middle of the eight century Ninurta's role seems to have given to Nabu in Assyria. There are some epithets which attest Ninurta as the god of scribal arts. Like Nabu, Ninurta is sometimes called "sage of the gods" (apkal ilāni), for example in the royal inscription of Assurnasirpal II (Grayson 1991: 194, ln. 5 & parallel 229, ln. 9). In the hymn to Ninurta as the helper in misery, edited by Werner Mayer (1992), the god is in one section described in terms of a scribe: ummânu mudû a kīma āri ana mihilti iziqqa u kullat ţuparrūtu kīma gurunne ina kariu kamsu "the wise scholar, who like a wind blows (= yearns for?) towards cuneiform signs and (who) has all the craft of the scribe packed into his mind (= stomach) like beer" (section xix). Ninurta is further called the "scribe of Earra" (āţir Earra) in a Babylonian ritual text edited by B. Pongratz-Leisten, ina ulmi īrub, text no. 17, ln.9. Ninurta is called "Enlil's sealkeeper" (kiib-gál or kiib-lá), the "sealkeeper of father Enlil, he who makes the great me's perfect" in the Sumerian collection of temple hymns. In Angimdimma line 93., Ninurta is called the "seal-bearer of Enlil" - kiib-lá den-líl-lá, (see Cooper 1978: 72 and comm.) and Lugale 235-36 states: Storm of the rebel lands, who grinds the Mountains like flour, Ninurta, Enlil's seal-bearer, go to it! Sumerian legal taboos are often those of Ninurta, as William Hallo (1985: 24) has pointed out. For example (YBC 7351): "A judge who perverts justice, a curse which falls on the righteous party, a (first-born) heir who drives the younger (son) out of the patrimony - these are abominations of Ninurta" (di-ku5 níg-gi-na hul-a/ á á-zi-da bal-a/ dumu-nitah-tur-ra é-ad-da-na-ka/íb-ta-an-sar-re/ níg-gig dNin-urta-ke4). A variant of this taboo attests Utu instead of Ninurta (UET 6/2 259, see ibid) and the Proverb Collection 14 attests a further variant: "To seize someone with unauthorized force, to prounounce an unauthorized verdict, to have the younger (son) driven out of the patrimony by the (first-born) heir - these are abominations of Ninurta" (Hallo 1985: 24). Ninurta is a protector of justice. From a legal document from Samsuiluna's 23rd year (BE 6/2, 58: 1), it emerges that Ninurta's weapon uruduíta situated at the gate of his temple in Nippur, before which one could take witness. In another document from Samsuiluna's first year (BE 6/2 62), a culprit has to stand "on the gate of the heroes' garden, before Ninurta" for taking witness. Another Ninurta's weapon, Udbanuilla was installed for trials before the gate ká du6 ur-sag-e-ne "gate of the heroes' mound" in Ninurta's temple, before which oaths could be sworn. Later in the first millennium Babylon according to topographical texts, Marduk's divine weapon Mutēir-hablim "who does right to the wronged" stood in the part of Esagil which was called é.di.ku5.mah, "the House of the Exalted Judge". This tradition certainly derives from traditions of Ninurta and Nippur, because the Marduk's weapon Mutēir-hablim is equated in an explanatory list together with dgi.tukul.dà.zu with weapons of Ninurta, dár.ur4 and dár.gaz (George 1992: 293). We can see how Ninurta's weapons were used as means to provide justice and to positively affect legal affairs. Ninurta's role as the sealkeeper of Enlil had a clear legacy in Assyria. The administrative centre of Assyrian Empire, bīt āli "City Hall" in Assur had a ceremonial name in Assyrian Temple List "where the Tablet of Destinies is sealed as a secret" (George 1986: 140). In Neo-Assyrian times the ceremonial name of the same building is attested as "House, edifice where the Tablet of Destinies is Sealed" (ibid. 141). Thus in the Assyrian tradition the seals of the god Assur were kept in the City Hall and not in his main temple Earra. The City Hall in Assur was intimately connected to Nabû's temple according to the topographical texts. In the same way as Ninurta in Nippur was the seal-keeper of Enlil, are the seals of the "Assyrian Enlil", Assur, kept in the temple of Nabû. The Seal of Destinies is impressed on the Esarhaddons's succession treaty. The inscription of this seal according to A. George "reveals the function of the Seal of Destinies to have been the sealing by Aur of both human and divine destinies, as irrevocably decreed by him in his position as king of the gods. There can be little doubt that the document ratified by Aur's sealing is, on the mythological plane, the Tablet of Destinies" (1986: 141). The second seal on Esarhaddons's succession treaty is the Old Assyrian seal of Assur of the City Hall according to its inscription. Thus in the City Hall of Assur (bīt āli), which was a part of Nabû temple and where Assur's seals were kept, the treaties and state documents were impressed with the seal of Assur of the City Hall and the Seal of Destinies. B. Pongratz-Leisten argues that the temples of Nabû a harê were the actual place where adê oaths of the Assyrian crown princes took place and where the king received his sceptre from Nabu (Pongratz-Leisten 1994: 97). These Assyrian practices were modelled on Babylonian ones and probably derived from Sumerian practicies in Nippur. We can remind that an oath invoking Ninurta and the king was used on some Nippur sale documents and there is also a comparable evidence from the Ur III period that various foreigners and functionaries took an oath of allegiance at the accession of the new king in the temple of Ninurta at Nippur, as pointed out by Piotr Steinkeller (1989: 74 n. 209). Pongratz-Leisten, Beate 1994 Ina ulmi īrub Die kulttopographische und ideologische Programmatik der akītu-Prozessionen in Babylonien und Assyrien im I. Jahrtausend v. Chr., BaF 16, Mainz: Ph. von Zabern.